The American Cancer Society (ACS) and the Houston Texans has awarded a grant to Legacy Community Health to address disparities in breast cancer mortality by providing access to breast cancer screening, follow-up of abnormal mammograms, and timely access to specialty care if needed. The grant funding was made possible through ACS’s partnership with the NFL and the League’s Crucial Catch campaign. The grants are the latest in ACS’s Community Health Advocates implementing Nationwide Grants for Empowerment and Equity (CHANGE) program, which provides funding opportunities as part of the ACS’s commitment to reduce disparities in cancer mortality. Legacy Community Health will receive a $100,000 over two years. The grants are focused primarily on African-American communities, but also target other underserved populations. Since 2009, the NFL’s Crucial Catch has raised more than $18 million in support of ACS. 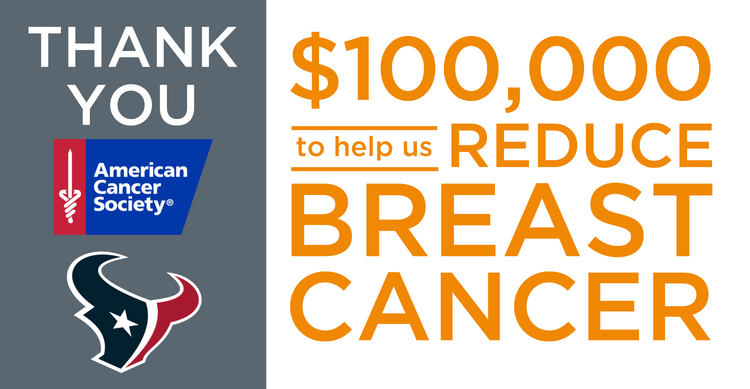 Funding raised since 2012 has supported ACS’s CHANGE program and has been invested in underserved communities to increase cancer education and awareness and promote life-saving screening tests. To date, health system grantees have reached more than 632,000 individuals with education, patient reminders and navigation to screening, and contributed to 138,000 breast, cervical and colorectal cancer screenings. These new grants will improve timely access to follow up care along with a continued focus on access to high-quality breast cancer screening for underserved women.